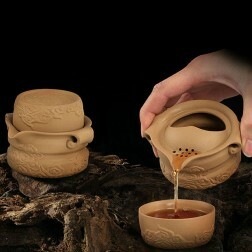 Portable tea sets normally being used for tours or traveling. It could also suitable to be used in a narrow working space, a small tea table, and take a drink by yourself or confabulate with one or two friends. 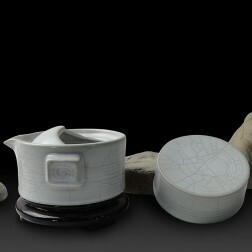 A portable tea set commonly come with a small teapot or a Gaiwan(covered tea bowl), several cups. 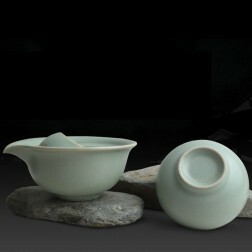 Some tea sets also includes serving pitcher, strainer or even a small tea tray. 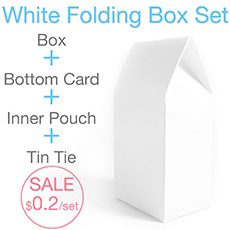 Some portable tea sets could be easily grouped together, convenient for collection. 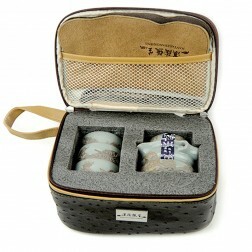 Some of the travel tea set packs are designed to be put into the tea tray or a travel bag after using. 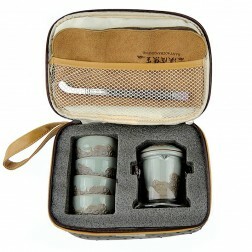 This portable tea set includes a hand-pot(with strainer), 4 cups, a piece of tweezers and towl. 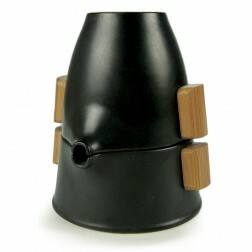 All tea-wares could be collected into a wood box which filled with polyester filling. Easy and safe to be carried. 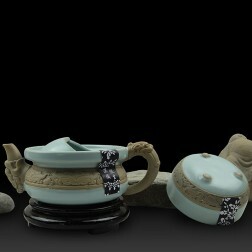 The tea set is made of pottery, which has been processed with half-glazed firing technics. Hand-carved with auspicious cloud pattern and coated with Imperial Jade glaze. You could enjoy an easy and simple tea time using this tea set. This portable tea set includes a quick tea set, 3 cups, a piece of tweezers. All tea-wares could be collected into a leather bag which filled with polyester filling. Easy and safe to be carried. 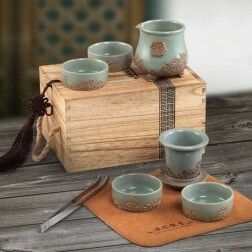 The tea set is made of Zinnober pottery, hand-carved with auspicious cloud pattern. You could enjoy an easy and simple tea time using this tea set. This portable tea set includes a quick tea set, 3 cups, a piece of tweezers. All tea-wares could be collected into a leather bag which filled with polyester filling. Easy and safe to be carried. 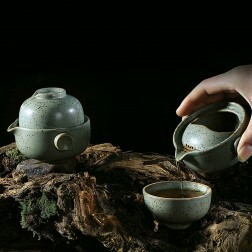 The tea set is made of pottery, which has been processed with half-glazed firing technics. 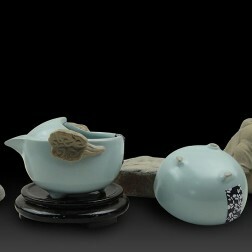 Hand-carved with auspicious cloud pattern and coated with Imperial Jade glaze. You could enjoy an easy and simple tea time using this tea set. This quick tea set includes a serving pitcher that has a filter function and a tea cup. 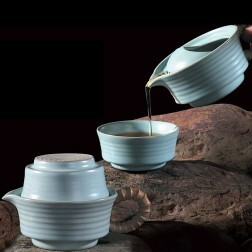 The tea set is made of pottery, which has been processed with half-glazed firing technics. The handle is hand-carved into dragon. 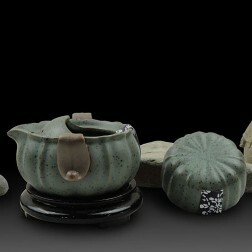 The pot and cup are coated with Imperial Jade glaze. You could enjoy an easy and simple tea time using this tea set. This quick tea set includes a serving pitcher that has a filter function and a tea cup. The tea set is made of Straw-burning pottery. The design is mellow and smooth. You could enjoy an easy and simple tea time using this tea set. This quick tea set includes a serving pitcher that has a filter function and a tea cup. 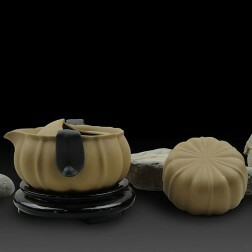 The tea set is made of Straw-burning pottery and hand-carved with vertical stripes pattern like the pumpkins. You could enjoy an easy and simple tea time using this tea set. This quick tea set includes a serving pitcher that has a filter function and a tea cup. 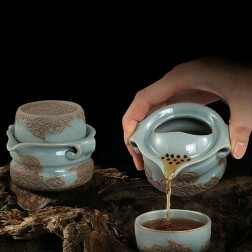 The tea set is made of Zinnober pottery and hand-carved with auspicious cloud pattern. You could enjoy an easy and simple tea time using this tea set. This quick tea set includes a serving pitcher that has a filter function and a tea cup. 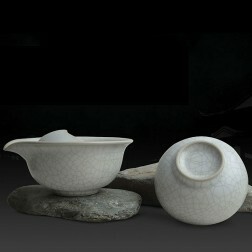 The tea set is made of pottery, which has been processed with half-glazed firing technics. 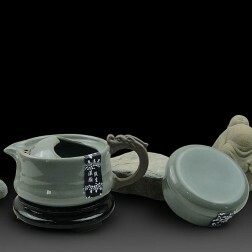 Hand-carved with auspicious cloud pattern and coated with Imperial Jade glaze. You could enjoy an easy and simple tea time using this tea set.